Heat 2 tbsp olive oil in a saucepan over medium-high heat, add onion and garlic, cook stirring occasionally for about 6 minutes until golden, add mince and brown well, breaking up with a wooden spoon, transfer to a bowl. Add potato to pan, stir occasionally until browned and almost tender, stir in spices then return mince to pan along with peas, season to taste with salt and freshly ground pepper. Refrigerate to chill completely, and then stir through herbs (30 minutes). For tomato relish, process onion, garlic and chilli in a food processor to finely chop. Heat 1½ tbsp olive oil in a saucepan over medium-high heat, add onion mixture and cook until tender. Add paprika and tomatoes, season to taste with salt and pepper and simmer for 8 minutes until thick and reduced, stir through vinegar and sugar and simmer for another minute. Serve warm or at room temperature and store in a sterile container in the fridge. Preheat oven to 200°C. Cut out 10cm rounds from pastry and spoon a little beef filling in the centre of each (you can re-roll the pastry scraps if you like, just press together, chill slightly and re-roll on a lightly floured surface). Brush edges of pastry with lightly beaten egg, fold over to form a half-moon, press edges to seal, crimping pastry with your fingers as you go, and finish by sealing with a fork. 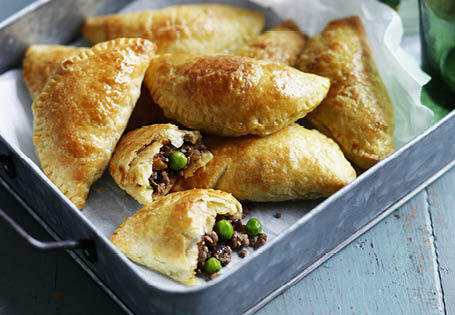 Place on a baking tray lined with baking paper (empanadas can be refrigerated for a few hours at this stage or baked straight away), brush with extra egg wash, season to taste with salt and pepper and bake for about 15 minutes until golden brown and puffed and serve hot with the tomato relish. Relish can be made up to a week ahead and stored in the fridge – the flavours develop even further over time so it pays to plan ahead. The empanadas can be assembled and frozen in a single layer on a tray until frozen, then stored in the freezer in a sealed snap-lock bag. Place on an oven tray and defrost in the fridge before baking.